Máy chiếu Panasonic PT-RZ370 chính hãng, giá rẻ nhất tại TP.HCM! The product number in the Americas and Taiwan is PT-RZ370U and PT-RW330U. The product number in Europe (except the UK) and CIS is PT-RZ370E and PT-RW330E. The product number in the UK, Asia (except Taiwan), Oceania, Middle East, and Africa is PT-RZ370EA and PT-RW330EA. In STANDARD/GRAPHIC picture mode. Measured based on the power consumption rate and a measurement method for the TV receiver. When the STANDBY MODE is set to ECO, network functions such as power on over the LAN network will not operate. Also, only certain commands can be received for external control using the serial terminal. Measurement, measuring conditions, and method of notation all comply with ISO 21118 international standards. WUXGA resolution is supported only when the signals are compliant with VESA CVT-RB (Coordinated Video Timing-Reduced Blanking). With legs at shortest position. Average value. May differ depending on the actual unit. 0-40 °C (32-104 °F) between 1,400 m and 2,700 m (4,593 ft and 8,858 ft) above sea level. 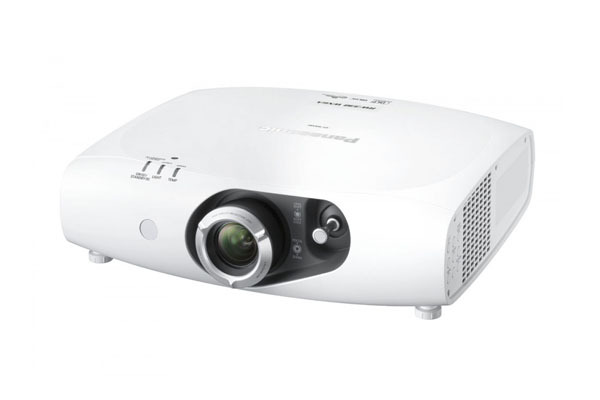 If the ambient temperature exceeds 35 °C (95 °F), the light output may be reduced to protect the projector. Power cords available (x 2) for the PT-RZ370EA/RW330EA. 1. Do not install the projector in locations that are subject to excessive water, humidity, steam, or oily smoke. Doing so may result in fire, malfunction, or electric shock. • Make sure there is an unobstructed space of 500 mm (1 ft 8 in) or more around the projector's exhaust openings. • Do not stack projector units directly on top of one another for the purpose of multiple (stacked) projection. When stacking projector units, be sure to provide the recommended space between units. 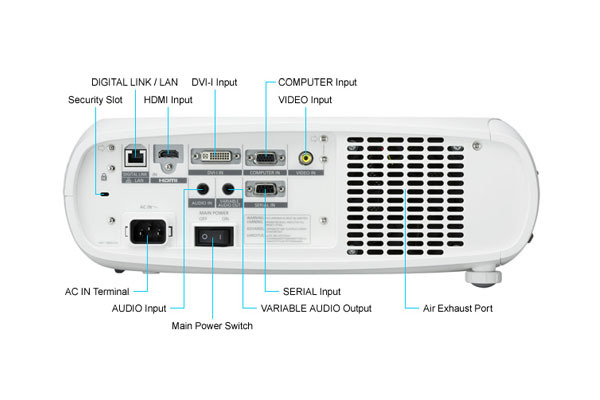 These space requirements also apply to installation where only one projector unit is operating at one time and the other unit is used as a backup. • Make sure that nothing blocks the projector's air intake and exhaust openings. Also, install the projector so that cool or hot air from other air conditioning equipment does not flow directly toward the projector's air intake or exhaust openings. • Do not install the projector in an enclosed space. If it is necessary to install it in an enclosed space, add a separate ventilation system. If ventilation is insufficient, hot air will accumulate at the intake opening. This may cause the projector's protective circuit to interrupt projector operation. • If the projector is placed in a box, ensure that the projector's intake and exhaust openings are not blocked. Take particular care to ensure that hot air from the exhaust openings is not sucked into the intake openings.